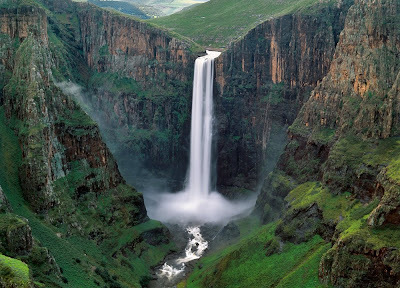 Largest waterfall in Lesotho, Africa. I'm pretending that for the next two months that I live down there where the fall meets the water. The coolness of that wonderful water. I guess I should clarify for visitors to this blog that I live in the Palm Springs area of Southern California. In Palm Desert, to be more precise (some would think this is a very important distinction too). I've lived in the desert for I think 15-20 years (with a sweet, cool respite in San Diego for 3 years) and up until the last couple of years I didn't mind the heat. But it has become so unbearably humid and the summer starts earlier and ends later every year. The other months out of the year it is ideal but I'm beginning to wonder. Anyway, I'll just focus on this beautiful photo which I found on the internet at the Greentree Gazette (http://www.greentreegazette.com/photoweek/load.aspx?art=972). I hope the rest of you are enjoying a cooler summer than we are here....in our own little hell.